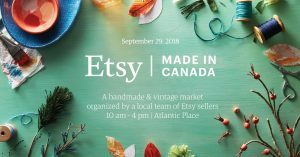 Join us on Saturday, September 29th from 10am-4pm for our annual Etsy: Made in Canada Market! Taking place in the heart of downtown at Atlantic Place, 215 Water Street. See Facebook group for more information. Click ‘going’ or ‘interested’ on Facebook to be notified about GIVEAWAYS, vendor stories, and more! With amazing natural light and a panoramic view of St. John’s harbor, Atlantic Place provides an incredible backdrop for our exclusive events held just three times a year. We are extremely grateful to MARTEK and Southwest Properties for their provision of this venue. Their sponsorship and support of our vision for an accessible, free downtown market help to make our events possible.